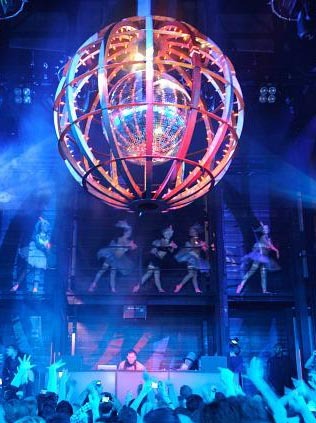 The venue is more than 62,000 square feet, with 50-foot-tall ceilings and an unparalleled multi-million-dollar sound stage designed to cater to any performer’s whim. Coliseum-style seating surrounds a focal dance floor, where one can marvel at the four-story LED screens and projection walls that will display customized light and image shows distinctly tailored for each performance. In addition to the Nightclub space, Marquee will debut its Dayclub in the warmer spring months. Featuring Grand Cabanas with individual infinity pools, the Dayclub also boasts a multitude of three-story Bungalow Lofts, complete with a cabana, living quarters and a party deck on top. Marquee has secured the top international house music DJs as residents, and the pairing of high-caliber DJs with the over-the-top extravagance of the club promises to impress even the most traveled tastemakers. If one’s taste is not in house music, the exquisite space offers a room called the “Boom Box” as a mixed-format area. With vast glass window-walls overlooking the famous Las Vegas Strip, the Boom Box offers a nightlife experience unlike any other venue. about 09:30 p.m. to 05:00 a.m.